See scan - perfect condition. This is a nice and scarce modern Russian Federation Space Staff Badge and given to those who serve at the Plesetsk Space Rocket Center. This is the military / Army Space center of the Russians Space and Rocket Space missile program. Scarce militaria / military collector piece and one of the rare modern Russian badges. Obverse has a stylized rocket and the Russian national flag colors with text underneath SAVING LIFE ON EARTH. All this is surrounded by a wreath and topped with a Russian Federation eagle holding a crest / Coat of Arms. Reverse is marked and numbered 2-0303. The holding knob is also marked by manufacturer POBEDA - MSOCOW. 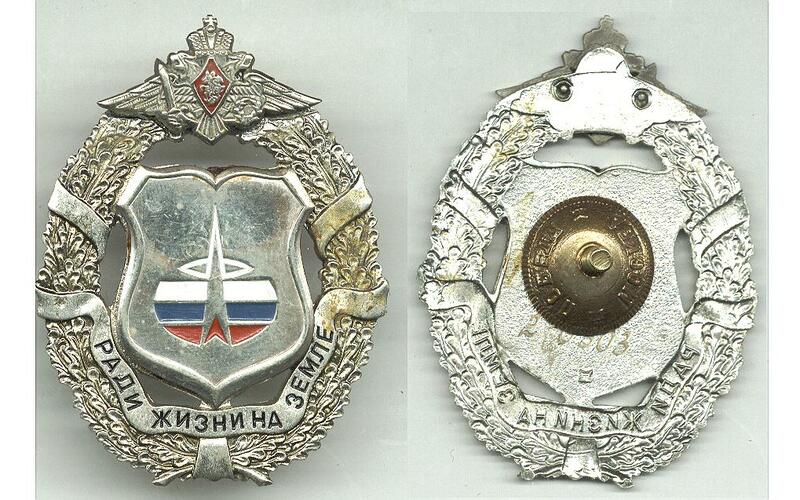 Badges from the Russian Military Space Forces are very scarce and rare. The badge is also silver plated. Nice and rare piece.